Other Details The word Ixora is derived from Hindi word "Eeshvar" probably because some plants of this genus are used in temples for worship. Regardless of the origin, it is indeed the lord of garden plants. A healthy Ixora is one of the most beautiful flowering plants in any garden. The plants possess leathery leaves and produce large clusters of tiny flowers in the summer. However Ixora is not for the faint hearted gardener. It is not very easy to keep it healthy. Ixora demands carefully adjusted soil pH. This is required to main the leaves green. Otherwise the leaves simply turn yellow and the ruin the image of the garden. The treatment of yellow leaves, which is the most common problem in Ixora, is to use ferrous sulfate. Ixora bears red berries. Images by Izhar & Arif shb. 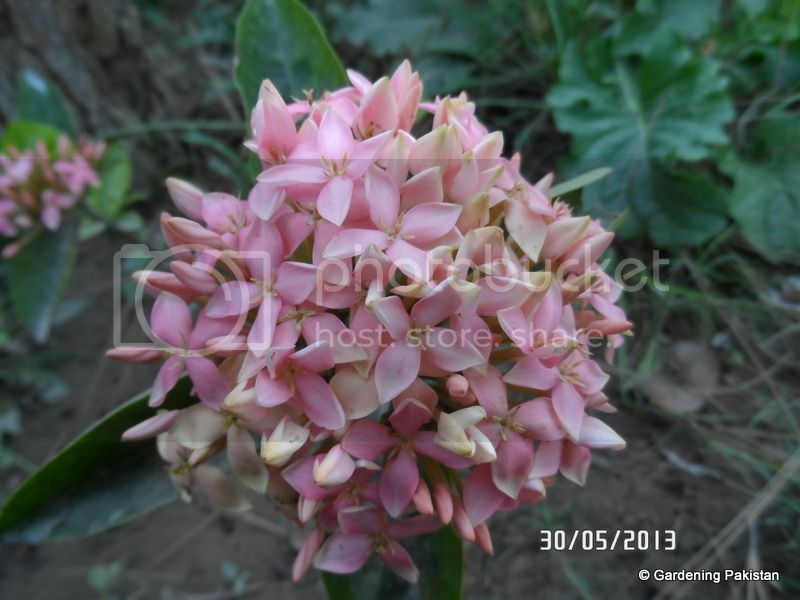 The double petalled variety, from University of Karachi's Botanical garden is called Ixora crimson star. 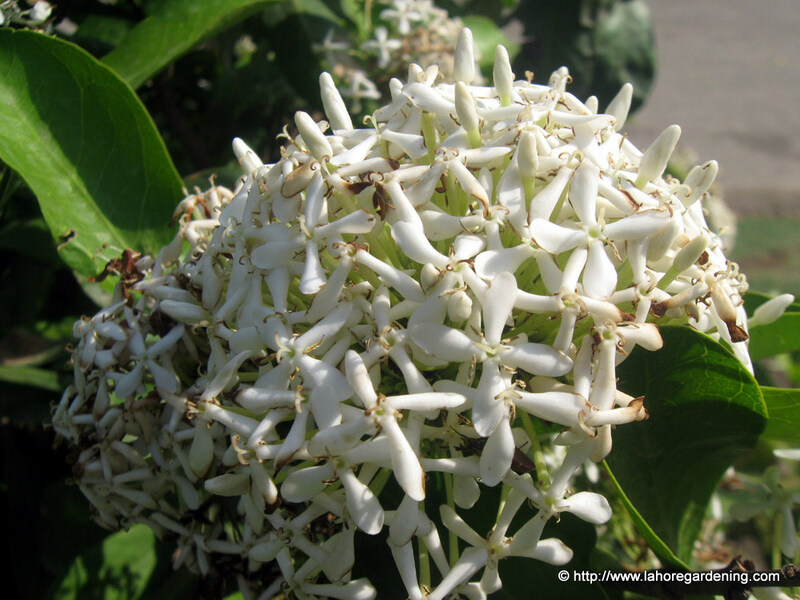 The white Ixora, is a fragrant species of Ixora called Ixora fragrans. The local white variety forms a shrub tree within a span of 7-8 years and is a shrub for all seasons. It blooms throughout the year and very fragrant. A picture of a mature Ixora shrub atleast 20 year old can be seen on my subsection post titled "Perennials for Butterflies/Bees". The red variety tagged as Ixora which pasted over the last picture is beautiful and seems to be a very rare variety. I think Mr A K Khan has written in his book that white fragrant ixora in pakistan is Ixora parviflora. I captured following fragrant white ixora in lawrence gardens lahore. I had always thought it is parviflora, but can some one confirm or fragrans ? If AK Khan has mentioned it then it must be Ixora Parviflora. Picture of my Ixora flowers bears resemblance to the picture posted by Khabbab. This shrub blooms throughout the year. Flower seeds drop on the ground and tend to form samplings. This plant is a butterfly and honey bee magnet. People interested can get samplings from me. I have the yellow Ixora, its beautiful. Farhan, this is the picture of My Yellow Ixora I had shared earlier..
Could someone add add tips for preventing yellowing of Ixora leaves? This would be helpful for everyone because it is a common problem...I could not find a decent cure of yellowing leaves in Ixora. Usually the yellowing of leaves occurs when the soil gets more alkaline which ought to remedied easily by applying a foliar spray of 'Seaweed with Sequestered Iron'.